A partial selection of my thread choices for two of my projects. 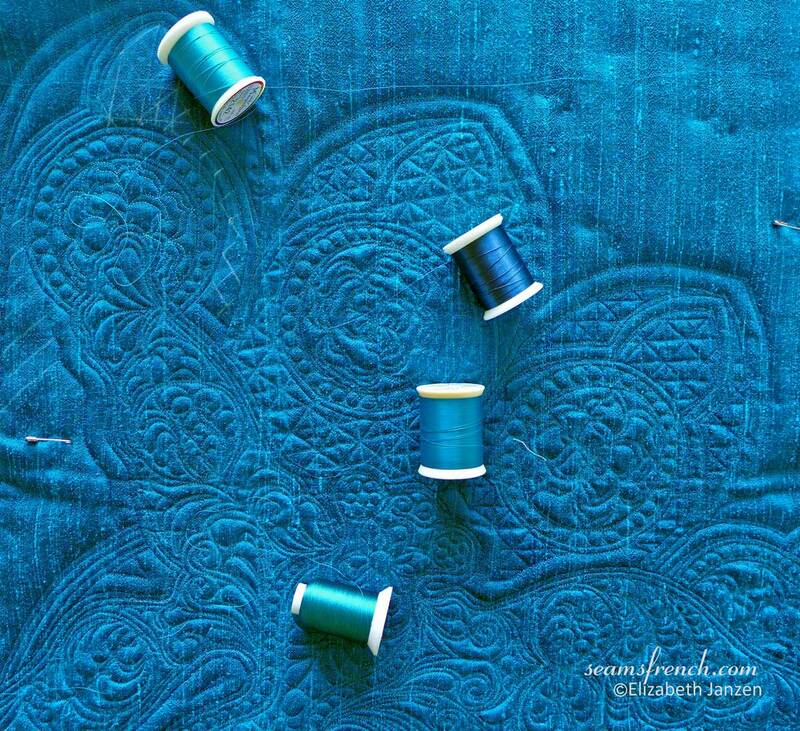 The teal quilt may also include some gold thread painting. A very early attempt at machine quilting. 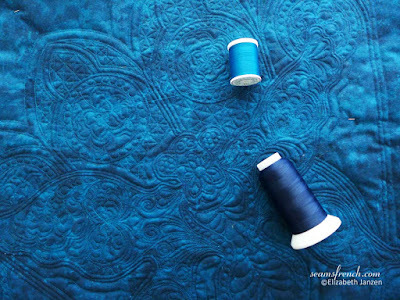 Aside from the rough machine quilting, the choice of a contrasting, heavier thread was clearly a mistake, especially for a novice. Aside from highlighting some poor stitching, note the obvious build up of thread on the main stem. 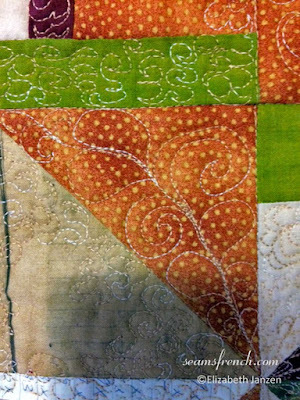 For subtle highlights in a main design feature, I prefer a heavier silk or poly thread to outline the motif. 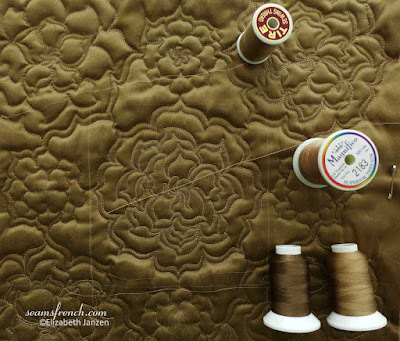 In this sample, all large gardenias, except for the top left hand side, have been stitched with Superior's "Magnifico", a 40 wt. poly. The top left has been stitched with Tire thread, a 50 wt. silk. (A dream to work with). 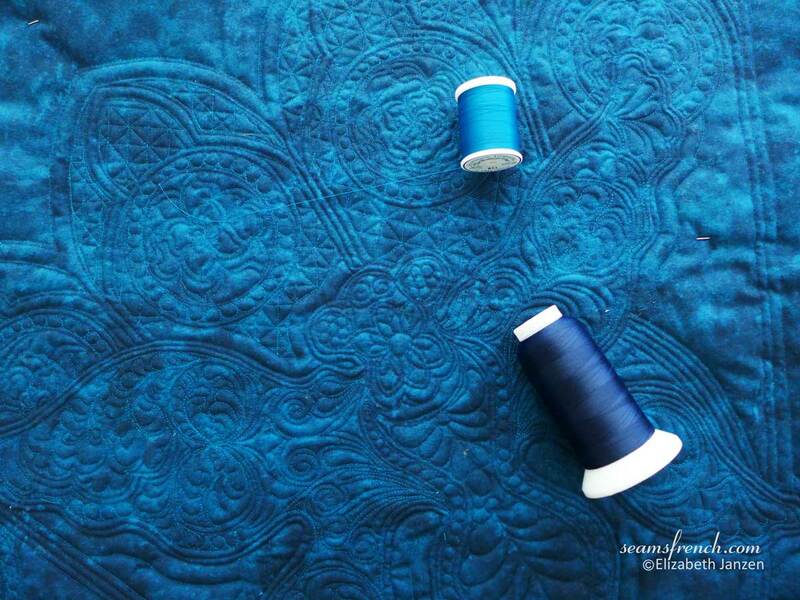 All other designs will be stitched with Kimono silk (the bottom two spools), a 100 wt. thread. The Kimono also works very well for background filler. 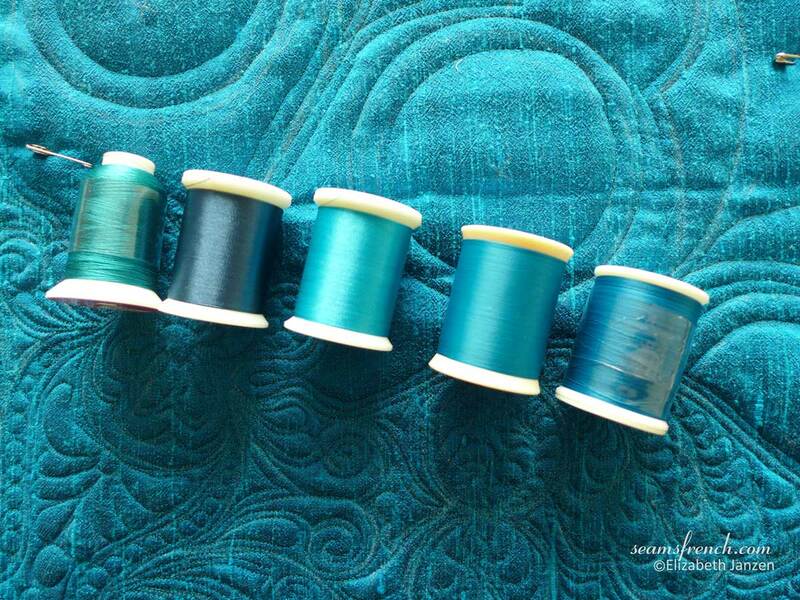 Although the weights and values vary, the above threads from Superior all blend in very nicely on the teal silk. This includes from left to right: 100 wt. 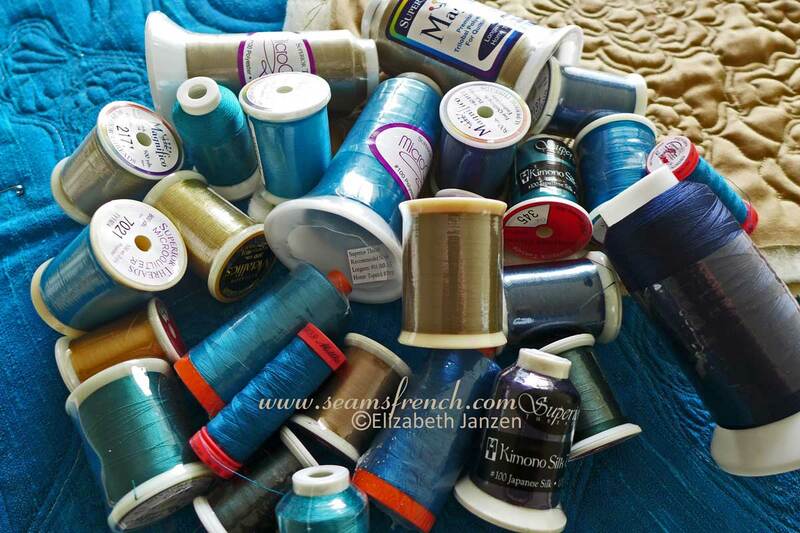 silk thread, 40 wt. poly thread in 2 shades, 100 wt. poly for micro quilting and a 60 wt. bobbin thread. Unfortunately the colour on these two teal samples (above and below) isn't very accurate. In reality, the colour is a blend of the two. Taking the time to play around with the colours is always a useful exercise. Which works best for highlights? Which should disappear into the fabric? Which is the best for fine detail? The top two threads in this sample, both 40 wt. poly, were used for the gardenias in the rose window. I found the lighter colour, (furthest to the left) too contrasting. The darker blue gives more of a subtle highlight. 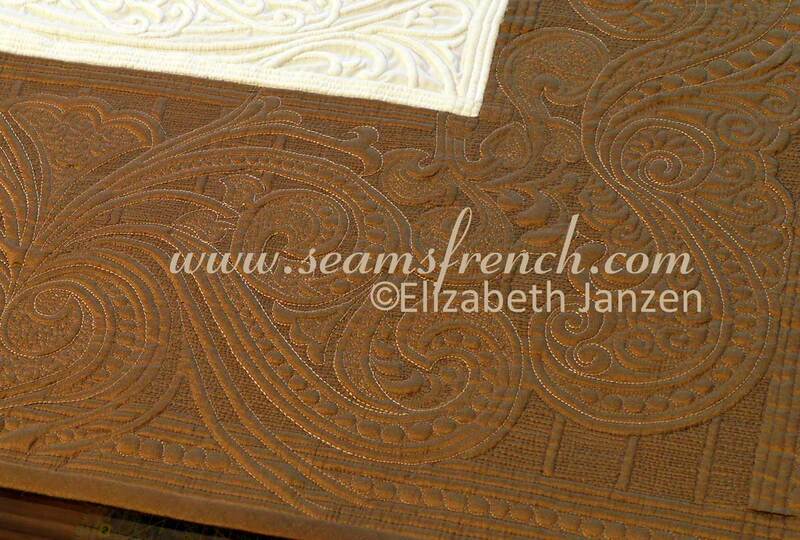 Where there is a lot of detail stitching, a fine thread does the best job, such as the 100 wt. Kimono silk. The butterfly was stitched entirely with this thread and outlined with the 40 wt. poly. Background filler is a great way to get relief to highlight a main motif without drawing attention to the stitching itself? A fine thread in a slightly darker tone works well for this. I found the 100 wt. poly "micro quilting" thread, second from the bottom, difficult to work with. My preference for that is the 100 wt. 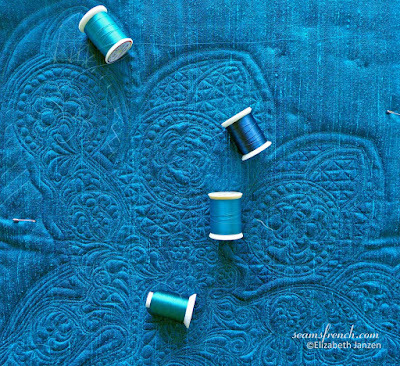 silk thread as well. On the back of the quilt, I used two colours of a 60 wt. poly bobbin thread. 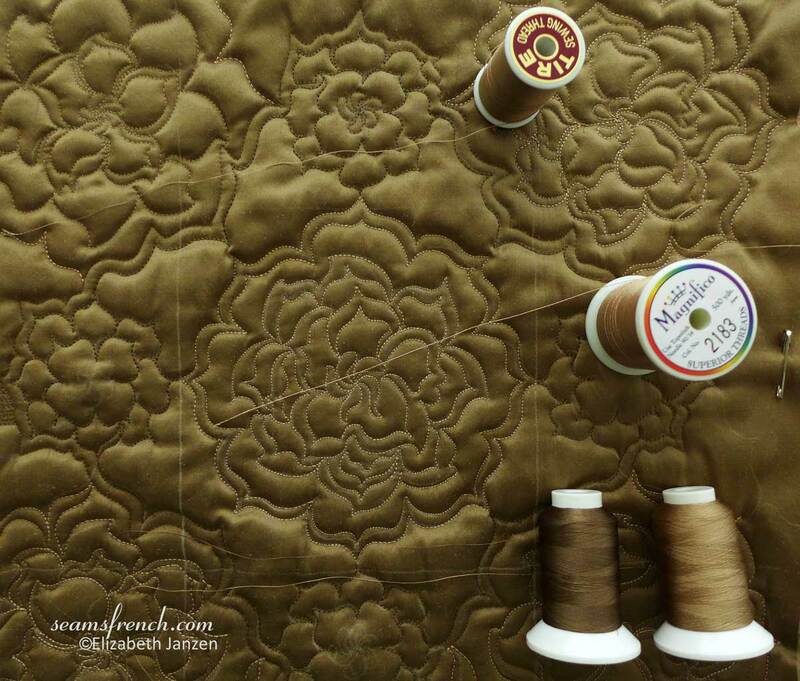 Below is a corner of a recently completed wall hanging where all of these different trials were put to the test. A 40 wt. poly was used to outline the major design features. All other stitching was done with the 100 wt. silk thread in two different shades. I have also been experimenting with some thread painting, which I will write more about next time. While making changes to the layout of this blog, I have some how disabled comments and contact info. My apologies. I am trying to rectify this, but so far no luck. If anyone has any advice for me on this, I would love to hear from you.